Place the 1 and 3 ball in the pockets as shown. 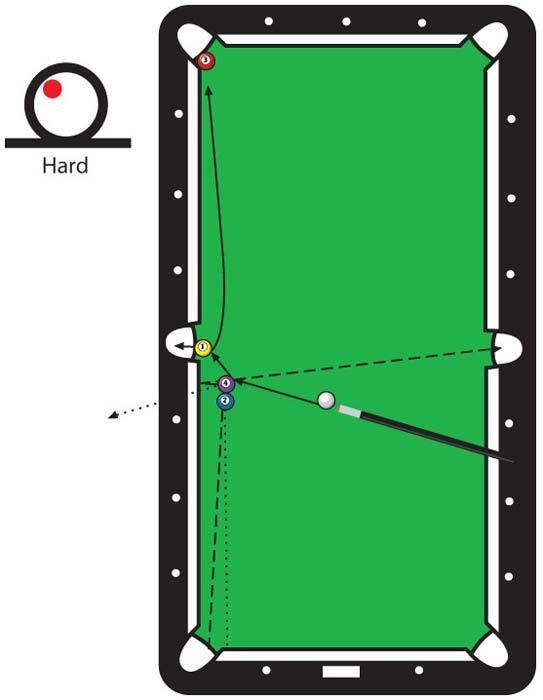 Freeze the 2 and 4 balls parallel to the rail about one and one-fourth balls off the rail and about one ball width from the side pocket. Hit the 4 ball hard with top left aiming the 4 in the direction of the dotted arrow. The cue ball caroms off the 4, hits the 1 and arcs on the 3. If you keep missing the ball, adjust your stroke. The cue ball crosses the 4 ball englishing it across side and the 2 ball is thrown into the corner.